I make wheel thrown functional ceramics. I use a white stoneware clay body and fire mid-range temperature glazes. The wares I create are influenced by Japanese Zen traditions that focus on mindful eating. I make pieces of pottery from earthenware clay and then fire the pieces to temperature. During the second firing, I take the pieces out of the kiln with long tongs and quickly lay strands of horse hair or feathers on the piece so the heat from the pottery burns the carbon into the clay body. I use several different techniques in layers to color the piece and give it texture. Wheel thrown and handbuilt stoneware pottery. My work is inspired by my wood-firing experiences. The process of fire and ash coalescing to create a rich, varied surface is captivating. Yet the desire to create unpredictable surfaces can be done in any firing atmosphere. I’ve been able to achieve the qualities of wood-firing in my electric kiln by relying on glaze choices and application methods. By combining the multiple sprayed glazes with spiraled slip, I strive to strike a balance between spontaneity and control. My Pots are wheel/thrown,altered stoneware. Surfaces are layered crackle slips over wood/ash glazes. Uptown Clay is a collaborative of 15 ceramic artists working in clay on Harriet Ave. just off the Midtown Greenway. We represent a gamut of ages, genders, and viewpoints with the shared objective of creating work in the ceramic medium. 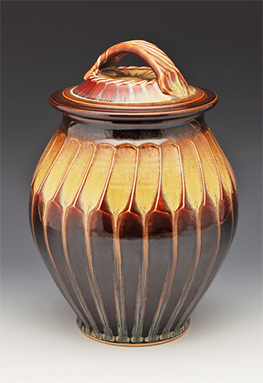 Most of us create functional ceramics, using a variety of techniques to arrive at a finished product. All of us are part time artists, who live and work in the urban neighborhood. Our work is sold selectively at a handful of shows. 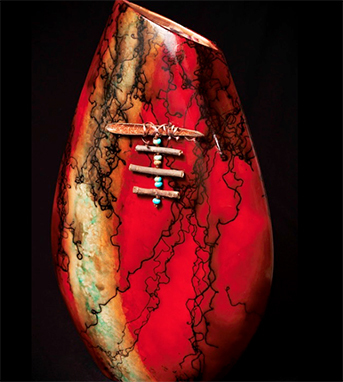 For the Loring Park Art Festival we will feature the work of two artists; Jon Loer and Sheryl Grassie. Sheryl creates stoneware ceramics on the pottery wheel, while Jon’s work is primarily hand built or cast ceramics. Both of these artists has been practicing their craft for over 20 years and have not sold at the Loring Park Art Festival before. Our price points range from $5.00- $60.00. Our modestly priced work is meant to be used and enjoyed by people in their daily lives. 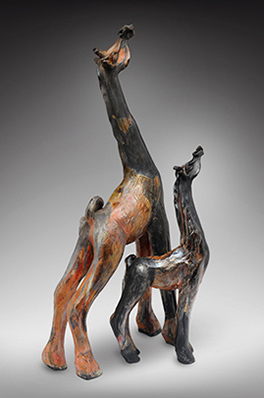 Adama Sow is a ceramist who originates from Senegal (West Africa). This master on the potter's wheel has been working with clay for more than twenty years now. After finishing high school and already inspired by his big brother Alpha Sow who also was a ceramist, Adama decided to go the Fine Art School of Dakar (Senegal) where he obtained his diploma in ceramics in 1987. As a rookie in the art world, Mr. Sow astonished everyone by the quality of his first exhibition at the Historic Museum of Goree in Dakar in 1989. During the next five years, he worked in Soumbedioune Ceramics and in his workshop in the capital city of Senegal. Also, he offered classes to both adults and children. In 1995, his thirst for Art took him to Germany where he attended the ceramics school in Horgrenzhausen. I create an imaginarium, a place where a user or viewer can go, to experience a different time, and, place. I create a forum for personal improvisation. Memory and imagination provide us a perspective of reality, and of the complexity of our lives. I am stimulated by an ever growing body of knowledge of man’s innate abilities and the effect of color on our emotions. My process includes the use of stoneware and porcelain clays. My work is formed on a wheel and altered, as well as hand formed. I use slips, stains, and glaze for my color palette. I fire in a soda atmosphere to “cone 10” or 2300 F. My work is vitreous and durable. I have always found comfort and enjoyment when working with my hands. When I discovered pottery in college, it became a match and I found myself being able to create work that was transpiring and satisfying. Pottery has always been what centers me. I have been drawn to Japanese and Korean pottery. About half of my work is wheel thrown, carved and altered and the other half of my work is handbuilt textured pottery that is highly tactile. I work with both high fire stoneware and raku. I really enjoy working with raku and am doing more and more with that process. Upon a lot of research I started to make my own glazes and create my pieces from my own perspective with an Asian influence. Over the years I have been inspired to create work that has a strong sculptural feel to it as well as a strong tactile feel to the piece at the same time. I try to only make work that I like myself and hopefully still find a market for my work that also enjoy what I do.